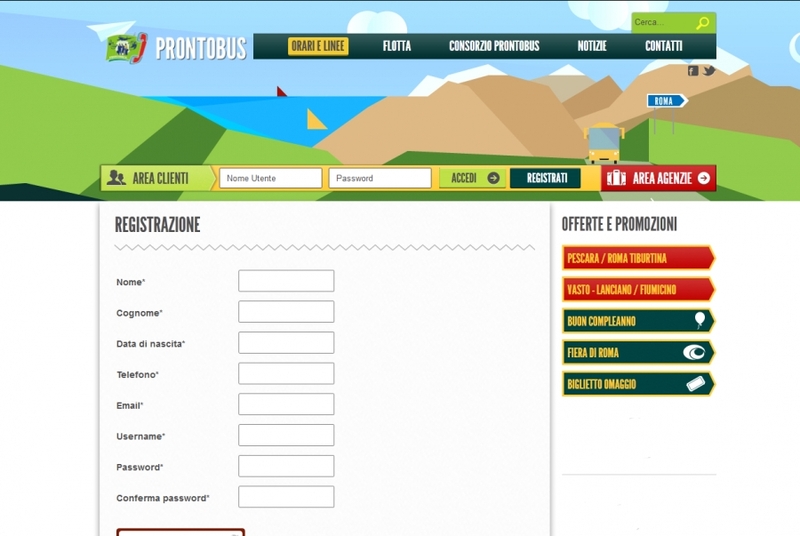 Prontobusitalia was created to make the booking process easier, faster and more intuitive. To benefit from the online services provided by Prontobus you need to sign up clicking here or the "sign up" button on the top of the booking page. - in case of difficulties in entering the control code click the double arrow and refresh the box. You will get a new word to be entered. Now you can complete the registration process: click the sign up button and, unless there have been mistakes, you will get a page with the next actions to do. An activation email has been sent to the email address entered during the registration. If you don't find the email verify in the spam or junk email folders; otherwise you probably sent a wrong address during the registration phase and you need to repeat the process. If you receive the activation email, click in the link that you find in e text or copy and paste it in the address bar of the Internet browser. You will get a message like this: "Hello Paolo Rossi, your account has been successfully activated". Now you can log in using the bar on the top. Enjoy your browsing and have a good journey!